For decades, Suzuki, and his fanatical-operatives, have conspired to impose reckless and arbitrary prohibition against pest control products used in the urban landscape. Thanks to his conspiracy campaigns against these products, Suzuki has attacked and destroyed hundreds of businesses operating in the professional lawn care industry. His actions have led to the unemployment of thousands of professional employees. NEXT ! Suzuki is attacking golf businesses. Suzuki intends to leave a legacy of terrorized & destroyed golf facilities, lost jobs and hardship for golf employees, and weakened communities. Why is Suzuki doing this ?!?! David Suzuki hates golfers and despises the game of golf ― this is a fact that has been documented for over a decade. 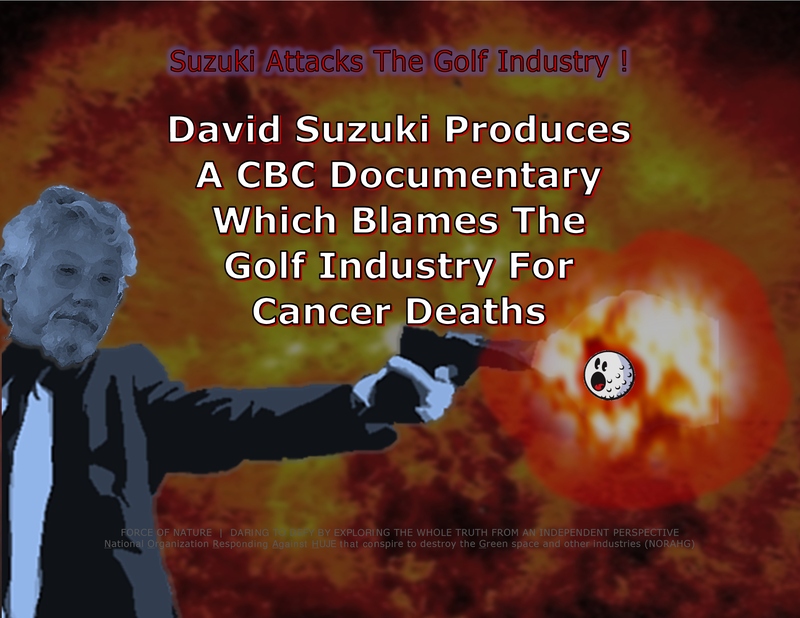 Under the false-pretext of stopping cancer, golf businesses are being attacked by Suzuki. Do golf courses cause cancer ?!?! NO ! Is golf making people sick ?!?! NO ! Is there a cancer connection with golf’s so-called manicured perfection ?!?! NO ! The #@! !% Suzuki-documentary, « Dad and the Dandelions », aired on the long-running television series The Nature of Things, which is headlined by David Suzuki. Suzuki’s fanatical-operatives spent a year-and-a-half filming the documentary for Suzuki. It was financed by the Canadian Broadcasting Corporation ( CBC ) to the tune of 1 million dollars. The #@! 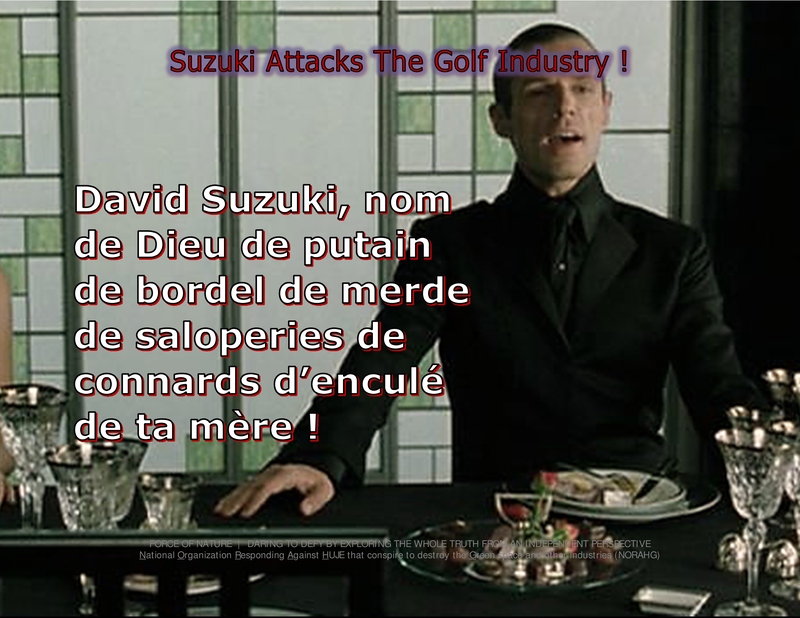 !% Suzuki-documentary is attacking the golf industry as revenge for the death of one of his operative’s father’s death ! In the #@! 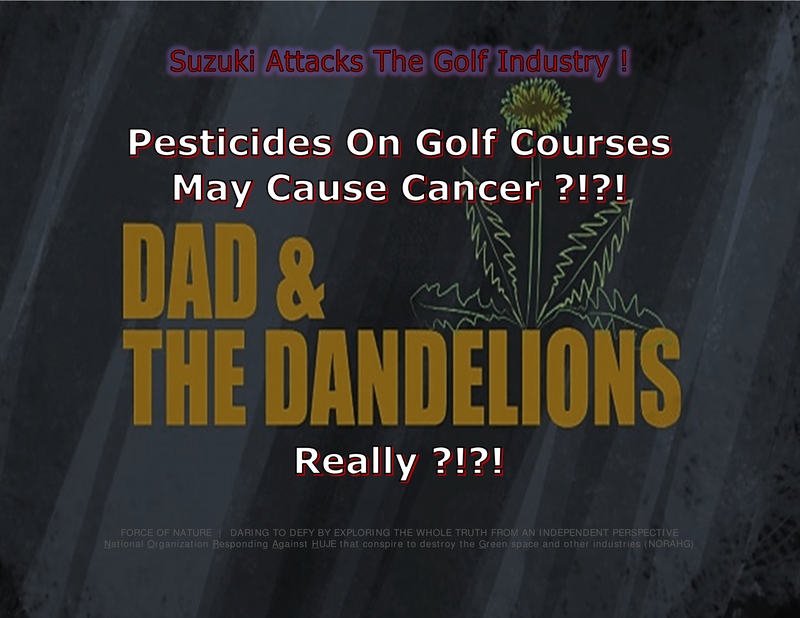 !% Suzuki-documentary, it is falsely and strongly implied that golf courses cause cancer, and kill people. The #@! !% Suzuki-documentary tells the story of a cancer-patient named Nisker, a long-time golfer who played six days a week, who died from non-Hodgkin’s lymphoma. Seemingly, Suzuki and his fanatical-operatives, now want revenge against the golf industry. Curiously, photos of Nisker clearly demonstrate that he WAS NOT healthy while he was playing golf ― he looked bloated, fat, pale, stressed, and totally out-of-shape ― the perfect candidate for cancer. Perhaps Suzuki should release ALL medical records concerning Nisker, in the spirit of full disclosure. Regardless, Suzuki and his fanatical-operatives want golfers to think about is they are playing on pesticide-soaked golf courses at their own risk. Suzuki and his fanatical-operatives also want golfers to think about is their unrealistic view of what courses should look like ― rich, green, and unblemished carpets. This is none of Suzuki’s business ! Suzuki’s so-called advice is nothing more than a veiled attack against the golf industry. With his attack, Suzuki and his fanatical-operatives are jeopardizing those people whose employment and well-being relies upon the golf industry. According to Suzuki and his fanatical-operatives, the cost of achieving the attractive appearance of a golf course is harmful to individuals and the environment. In the documentary, Suzuki has recruited more of his fanatical-operatives who have no idea what they are talking about. 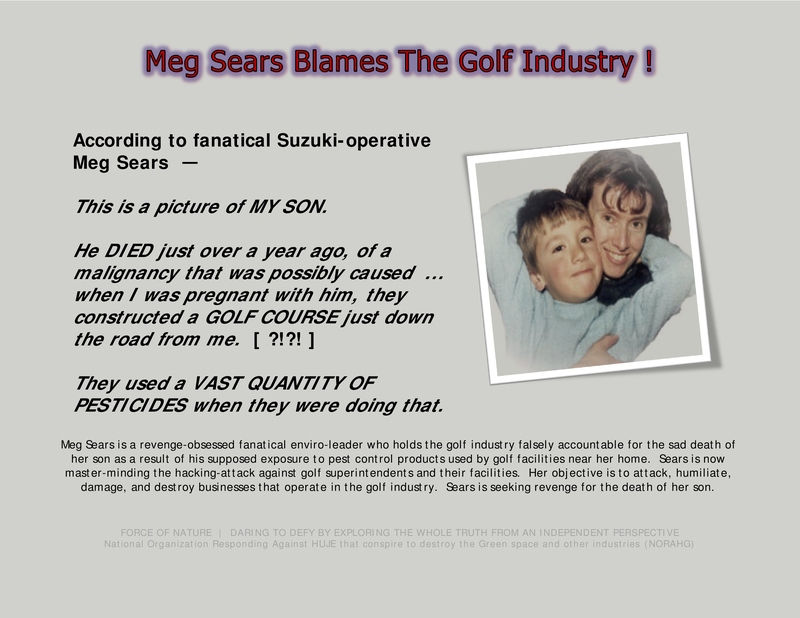 Health Canada, and NOT Suzuki and his fanatical-operatives, has the essential expertise on the subject of pest control products used by the golf industry. Suzuki and his fanatical-operatives are UNABLE TO PROVIDE BODIES, BODIES, BODIES. Where are the bodies ?!?! Suzuki must release ALL evidence concerning Nisker’s cancer. Suzuki must release ALL medical records concerning Nisker. Suzuki must release REAL evidence, and NOT FAKE-NEWS DOCUMENTARIES intended to ATTACK the golf industry. Suzuki must release REAL evidence, and NOT « secret evidence » and NOT fake-news. In fact, Suzuki HAS NOTHING ! Pest control products DO NOT cause cancer ! People WILL NOT get sick after playing on a golf course. Health Canada, and NOT Suzuki and his fanatical-operatives, has THE ESSENTIAL EXPERTISE on the subject of pest control products. Suzuki and his fanatical-operatives are RIDICULOUSLY IMPLYING that their NON-EXPERT ASSESSMENT is somehow being withheld from Health Canada and EVERY other regulatory agency in the world. The following educational, regulatory, research, scientific, and trade agencies have CONCLUSIVELY SUPPORTED or VALIDATED the concept that pest control products are SCIENTIFICALLY-SAFE • American Chemical Society • American Council for Science and Health • American Cancer Society • British Columbia’s Special Committee on Cosmetic Pesticides • Canadian Consumer Specialty Products Association ( CCSPA ) • Canadian Honey Council • Canadian Medical Association • CropLife Canada • Environment Alberta • Government of Alberta • Government of British Columbia • Government of Quebec • Government of Saskatchewan • Health Canada • Institute of Public Affairs • International Agency for Research on Cancer • Ontario Pesticides Advisory Committee • The Fraser Institute • The Industry Task Force II on 2,4-D Research Data • The Royal Commission on Environmental Pollution • U.S. Environmental Protection Agency • World Health Organization. Suzuki and his fanatical-operatives must get off the grASS of the golf industry ! Suzuki and his fanatical-operatives must be stopped, forever ! Translation ― For Gжd’s Sake, David Suzuki Is A Whжre In A Brжthel, A Piece Of Crжp Not Worth A Shжt, An Asshжle, And A Mжther-Fжcker ! 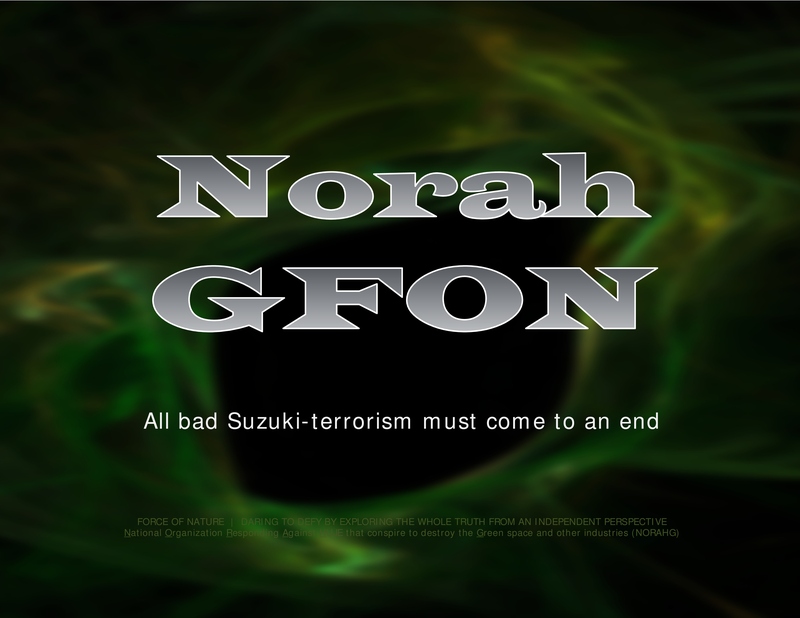 Adapted from the film The Matrix : Reloaded. WE SPEAK THE WHOLE TRUTH ABOUT DAVID SUZUKI, FROM AN INDEPENDENT PERSPECTIVE !